ARE THE CARS ONLY USED FOR WEDDINGS? We mainly specialise in weddings from Friday to Sunday. We most definitely hire our "Old skool" cars for school formals, special occasions, Movies, commercials, music videos and promotional work. Our Classic Cars are available any day of the week. 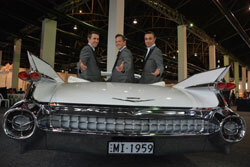 HOW LONG DO WE GET CARS FOR FORMALS? All passengers are to meet at the one pick up location, we allow 1 stop between drop-off to meet other friends and take photos before arriving at the function, the duration from arrival to departure should not exceed 1hour otherwise additional charges may apply. WHAT IS A GETAWAY SERVICE? You get to leave "in style" and make that last impression. 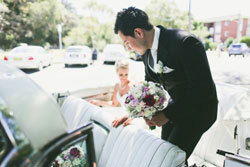 A 1959 Cadillac convertible will pick your newlywed selves up from the reception and transfer you to your desired location whether it be home or a hotel, the duration of the getaway service should not exceed 1hour, including waiting time. HOW MANY PASSENGERS CAN FIT IN THE CARS? Travel in spacious interiors and experience the very best of the 1950's without having to hire lots of cars to cater for your bridal party, more importantly keeping the cost down. Our 1959 Cadillac convertibles have the original bench seats so they can seat 5 passengers plus the driver, that's 3 in the back and 2 passengers at front. Our 1959 Cadillac Super stretch Limousine is a particularly a good idea if you have a large bridal party, as they can travel together in 1 vehicle- in the lap of luxury. The limousine has a seating capacity for up to 10 Passengers in the rear. When contacting Ace American Convertibles for an initial quote we encourage you to provide us with as much information as possible so that we can give you an accurate quote. We have cheap car hire packages to meet your budget with competitive rates. Timing is based from the 1st point of pick up to the reception and GST is inclusive. Some factors which will significantly impact your quote is the day and season you require the service as some are more popular than others. Wedding Tip: Consider an Autumn/Winter, Friday or Sunday wedding as more services are available and we can negotiate discounts. CAN WE SEE THE CARS? We welcome you to our showroom to view our entire fleet. It's the only way you can appreciate their size, gleaming paintwork, interiors and chrome. Photos just don't do these cars justice. It's also great to sit down and discuss your special day. Viewings can be made via appointment. HOW DO WE SECURE A BOOKING? We require 30% deposit to secure the vehicles for your event. The remaining balance doesn't need to be paid until 2 weeks prior to the occasion. To make it even easier, you are welcome to make partial payments leading up to the event for one less thing to worry about. HOW FAR IN ADVANCE SHOULD I BOOK THE CARS? Some dates are very popular. Many Brides book 12 months in advance. We don't want to disappoint you. Especially when you are looking for transport that is popular. WHAT IS SUPPLIED WITH THE CARS? Cars come fully detailed with white ribbons and red carpet if required and professionally uniformed chauffeurs. A service of 3 hours or more includes, champagne, refreshments and appetizers at the photo shoot location for you and the bridal party. We have additional signage in our showroom which you are welcome to request and use as props. Our drivers are all well presented, uniformed in pants and black shirts. Suits and black jackets can be worn in the winter. CAN WE SMOKE OR DRINK IN THE CARS? Smoking or the consumption of alcohol is not permitted in vehicles. (Transport Authority Regulations.) Refreshment will be served at the photo shoot location. DO THE CONVERTIBLES HAVE ROOFS? Yes. Whether you desire the top up or down on your convertible to protect your hair or just as shelter from the elements, your Ace American experience will provide the best of both worlds delivering style, fun and glamour. Having a convertible is the best part of it, with no windows or door pillars to get in the way, this beautiful car makes it easy to get in and out of and is perfect for those great in car photos. What about my hair Ace? "I hear you say." With our years of experience with convertibles we recommend travelling to your service with the roof up. As we near your service venue we will drop the roof. You will arrive in convertible style with your hair as fresh as coming out of the salon. We usually watch the weather forecast, and suggest you have a backup photo-shoot location prepared, these entail: hotel foyers, pubs, photographer's studios and heritage houses. Some places require bookings and payments in advance for use of their premises. We provide LARGE black golf umbrellas for the entire bridal party. They look so good in photos people use them when it's not raining! HOW MANY WEDDING CARS WILL I NEED? 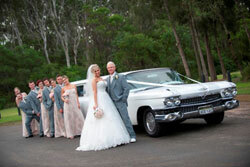 The size of the bridal party and budget will usually dictate how many vehicles are required. The Bride and her parents usually travel together to the ceremony and are followed by the bridesmaids. 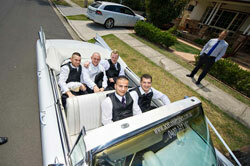 The groom and best man also require transport, and a car hired for them will help ensure they arrive in good time. After the ceremony the bride and groom are the first to leave the ceremony in the main car. The time spent in the car on your wedding is probably the only time you will have all day to relax, reflect and unwind and have a "chat" with your new spouse on the way to the reception. They are followed by the bridal party in as many vehicles as necessary. 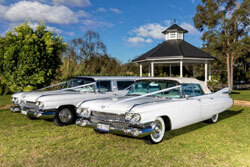 If you are having a large bridal party; you may need three or more cars. In this instance, the norm is to allocate one car for the bride and groom, one for the bridesmaids and one for the groom's party. 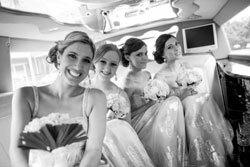 Our 10 seater Stretch limousine is a particularly good idea if you have a large fun bridal party, as they can all travel together in one car, or pair it with our matching convertible Cadillac. HOW LONG DO I NEED TO BOOK THE WEDDING CARS FOR? We have a minimum of 3 hour packages, hours required can be determined by calculating what time you wish to leave to arrive at the ceremony, to the time you wish to arrive at the reception. Direct transfers are also available; this is a simple pickup and drop off service. WHAT TIME DO I NEED TO LEAVE FOR THE CEREMONY? The groom and groomsmen should arrive at the ceremony about 20minutes before the ceremony is due to commence, to greet guests as they arrive. While most brides think it is "tradition" to arrive late, no one likes to wait. It usually takes about 10-15minutes from when the bride arrives at the ceremony to when she is ready to walk down the aisle, so make sure you allow for this time. That way, you can do the grand entrance looking confident and radiant rather than nervous and flustered. ARE CADILLACS AND CHEVYS THE SAME CAR? Cadillac's are often mistaken for Chevys or Chevrolets because they are part of the famous 50's classic car era. The Cadillac made famous by Elvis, Marilyn Munroe and James Dean evoked a world of riches and expression unmatched by any other car. Other cars like the mustang, Rolls Royce, Bentley also evolved but due to their affordability amongst the working class became far too common. If at heart you're an old fashioned kinda girl, then the classic Cadillac is the perfect choice. 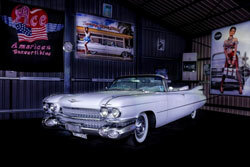 They are among the most popular choices for wedding transport and make timeless photo backdrops.